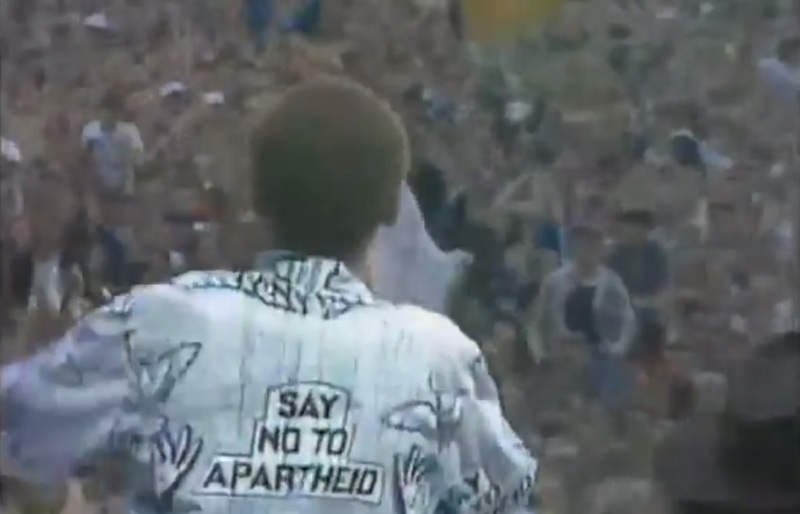 Professor John Street considers the importance of music to the anti-apartheid struggle. The day after Nelson Mandela died, Channel 4 News ended their evening broadcast with a song. Not any song, of course, but that song: ‘Free Nelson Mandela’. And not the 1984 recording by The Special AKA, but an instrumental version by Jerry Dammers’ Spatial AKA Orchestra (his tribute to Sun Ra’s Arkestra). Delivered by two ranks of brass instruments, percussionists, a string section and Dammers on keyboards, it sounded like a New Orleans funeral march. Accompanied by a montage of images of the great man, it proved a moving finale to the news. The broadcasters’ assumption was, of course, that ‘Free Nelson Mandela’ had a played a part in his release from prison. It had brought his name to a public that, at the time, knew little about him. Dammers himself admits that he knew almost nothing about Mandela. With its infection rhythm, joyous chorus and lyrics with their undeniable theme and humanising detail (‘shoes too small to fit his feet’), Dammers had found a winning formula and a Top Ten hit. The song became an anthem for a movement. And to this extent, it did indeed seem to make a difference. Dammers wasn’t by any means the first Western pop artist to contribute to the anti-apartheid struggle. Four years earlier Peter Gabriel had recorded ‘Biko’ (1980). Where ‘Free Nelson Mandela’ was celebratory, Gabriel’s tune was mournful; its anger elegantly clothed. It too gave a face and a focus, an education even, to those who might otherwise ignored the struggle. These songs probably did much to articulate opposition in the West to the apartheid regime, giving some kind of support to the work of exiled South African musicians like Miriam Makeba and Hugh Masekela. It is hard to know how much they led the campaign, and how much they reflected it. They certainly simplified it, and gave it popular presence. But for the more complicated, that is more difficult politics, there was a different beat. Two records stand out – Artists United Against Apartheid’s Sun City (1985), and Paul Simon’s Graceland (1986). Both – in their different ways – brought home the issues raised by the cultural boycott of South Africa, and the divisions that it provoked. Steve van Zandt and Arthur Baker produced a theme tune (and compilation album) to those who supported the boycott. Simon broke it by working with South African musicians. Where Dammers and Gabriel united audiences in their condemnation and determination, Simon and AUAA divided them. Their respective musical pleasures posed awkward questions and made difficult demands. Professor John Street is John Street is a professor of politics in the School of Political, Social and International Studies. His main research interests are: the relationship between copyright and creativity; the politics of popular music; the ‘popularization’ of politics; and cultural value and cultural policy.